Managing how your business appears when a user searches for you in Google can have a profound impact on your online reputation. Part of this involves making sure that your business’s Knowledge Panel in the right sidebar of Google is complete and up-to-date. While you can’t fully control all information in the Knowledge Panel, you can do quite a bit to make yours informative and effective. 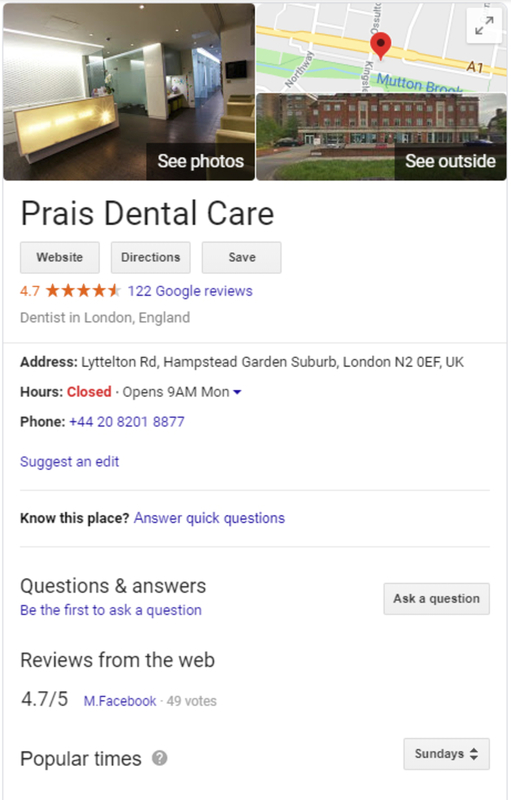 Prais Dental Care is one business that has done an outstanding job with their Google Knowledge Panel, and you can learn from their example. Here is the top half of their panel. Following are the main Knowledge Panel features, why they matter and what you can do to optimize how your business is listed. Photos and videos may be owner- or user-generated, so you must monitor for spam. High-quality photos can boost click-through rates, so don’t treat these as an afterthought. If you post more than two videos here, you will see a separate mobile video sub-tab in your business listing. Also, ensure that the map marker “pin” for your business is correctly placed on the map. The exterior photo on the Knowledge Panel is from Google Street View, and if your map marker isn’t placed correctly, this photo will be incorrect. You provide your business name, though the public can edit it. The “Website” and “Directions” buttons are self-explanatory. If your business has multiple locations, be certain the “Website” button takes the user to the correct URL. The “Save” button lets users save the location to their map or view the location on Google Maps. The number of review stars is not a strict average, but similar to a Bayesian average (although Google’s method for calculating it is proprietary). Calculation of the star rating incorporates a true mean and a constant that is proportional to the number of data points. It is helpful when there are fewer data points in an average. When someone clicks on the review count, they go to the separate review interface where they can read all your business’s online reviews. The Q&A section is relatively new and increasingly important. Businesses can post their own FAQs and answers as well as responding to customer questions. 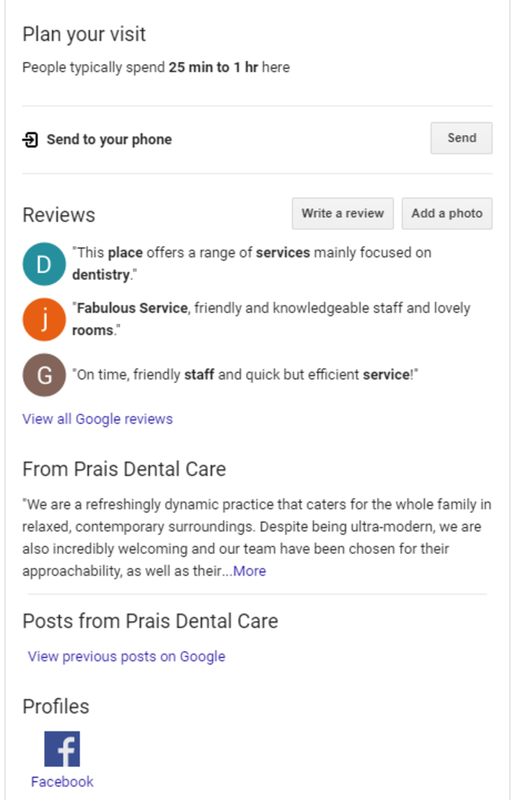 “Reviews from the web” is clickable and goes to the site listed next to the rating number, which in Prais Dental’s case, is 4.7/5. Clicking on the link beside that rating takes the user to Facebook reviews. Here is the lower half of Prais Dental’s Knowledge Panel. The Reviews listed here come from Google reviews. Three reviews are on display, and how they are selected is proprietary to Google. Business owners can respond to these reviews through their Google My Business dashboard, and it’s smart to do so. A quick response to a review demonstrates strong customer focus. This section of the Knowledge Panel offers a prime opportunity for business owners to showcase their competitive differentiators. You have 750 characters in which to do this. Be aware that you are not allowed to use this section to announce sales or promotions, because doing so violates Google My Business guidelines. Links to your business’s social media profiles conveniently appear here. Users can click to visit your profiles on social media. Consumers crave information, and the better your business listings, the greater their satisfaction. Reputation.com’s client Prais Dental has put considerable effort into building their Knowledge Panel. At a glance, potential customers can take in relevant information that is designed to encourage interaction. Moreover, their Knowledge Panel makes it simple to find and contact them, and findability is a key factor in a business’s overall Reputation Score. While the specifics of Google My Business evolve, regular attention to business listings is always wise for ensuring a strong online reputation. Reputation.com invites you to download our free guide to Top Trends for Online Reputation Management.